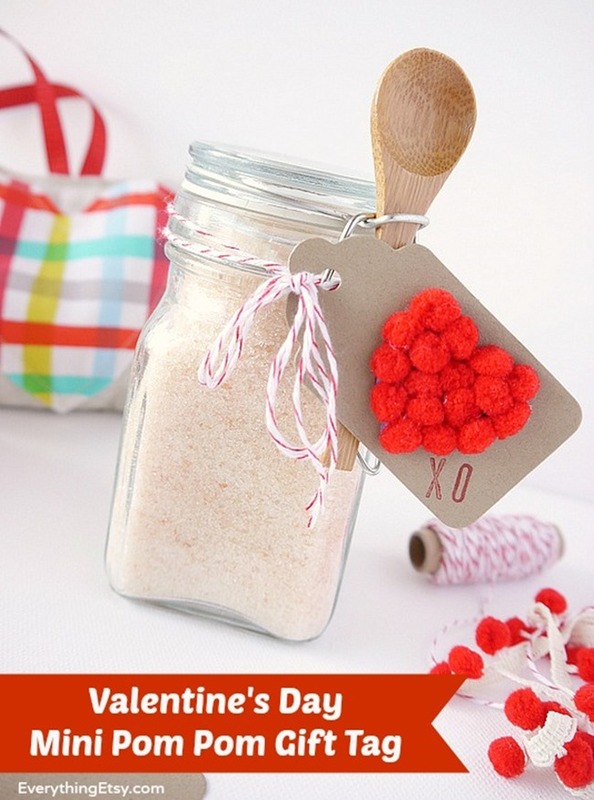 Valentine’s Day will be here before you know it, so start preparing with easy handmade projects. 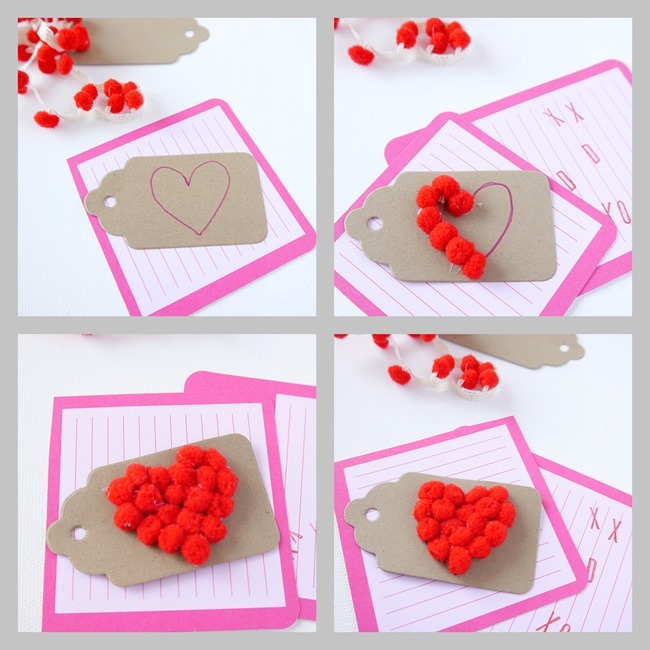 Valentine’s Day mini pom pom heart gift tags are super simple and a sweet little way to top off any gift with a little handmade goodness. What’s not to love about pom poms in any size, right??? I made a batch of these tags using some pom pom ribbon that I had stashed away for months. It was part of a big mess of tangled ribbon in a jar..not so good. I always thought I would wrap a gift with it, but there’s something about this ribbon that just didn’t look right each time I tried to use it. So, I cut the little pom poms off! It’s a big crafty no-no to ever waste a pom pom, so I had to come up with an idea. 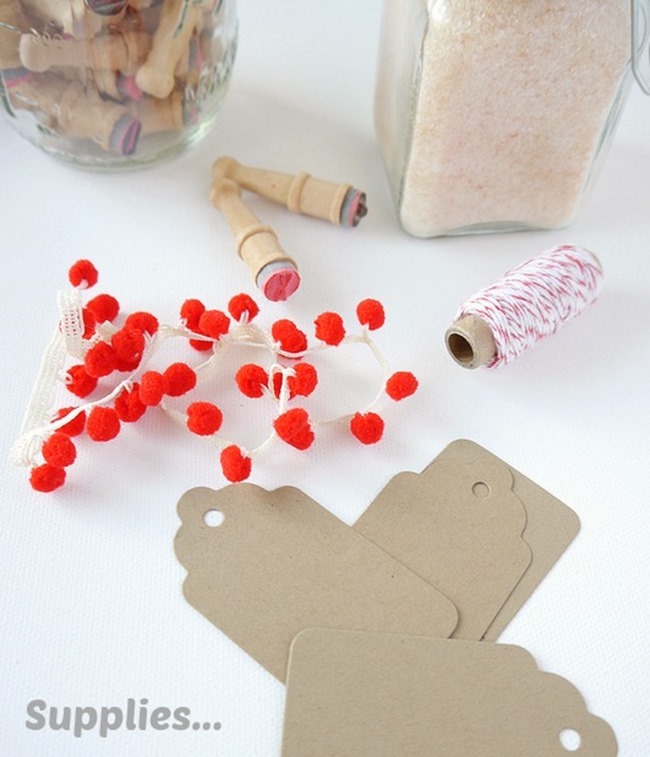 These pom pom gift tags are a quick holiday project! 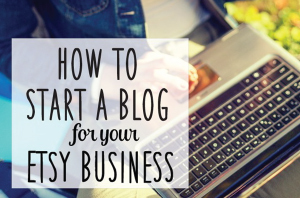 I know you have most of these things already. I used hot glue because it was strong and held the pom poms in place while squishing them all together. 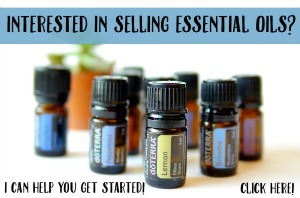 I think regular glue would move too much and you’re heart would get all out of whack…no one wants that! The pom pom can be found in the scrapbook supply or sewing section, so look in both spots of your store to find the perfect size little pom poms. Just cut off as many pom poms as you need. I cut the tags with my Big Shot cutting machine, but you can buy packages of these in any craft store. Draw a heart on your tag. Start adding pom pom around the outside of the heart. Then fill the inside…make sure to really pack them in there. You’ll need to trim the heart along the edge to give it the perfect shape. Don’t be afraid to trim quite a bit. Once you’re done with the heart you can stamp a name or “xo” on the tag. 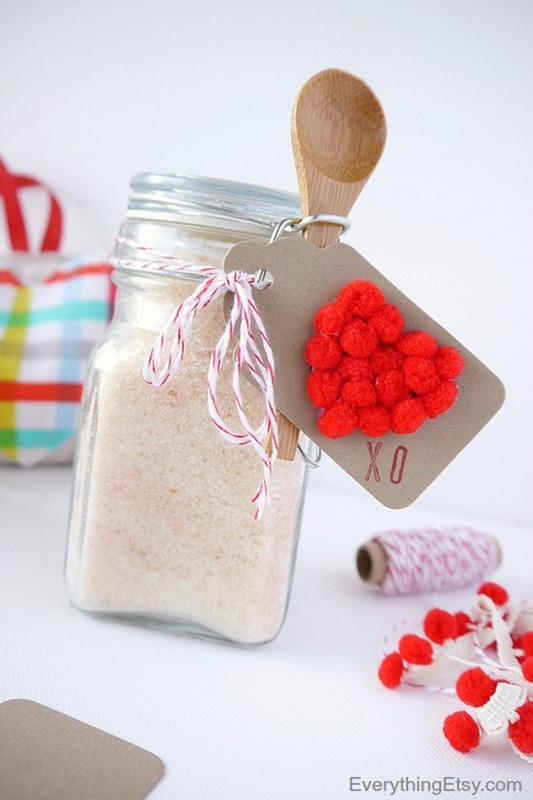 Top off any gift with a little pom pom love tag! This tag is topping of my Homemade Bath Salt with a little twine. 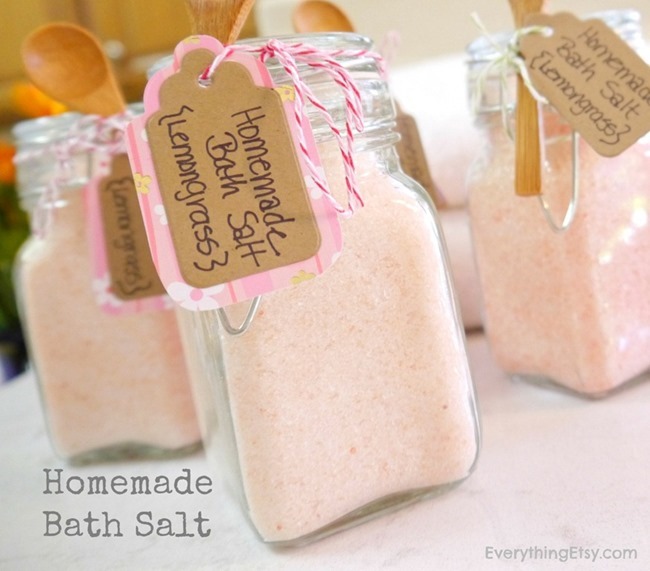 Here’s the Homemade Bath Salt Tutorial just in case you want to use them as a teacher gift this Valentine’s Day. It only takes a few minutes to make…one of my favorite DIY gifts, for sure. Do you love pom poms??? 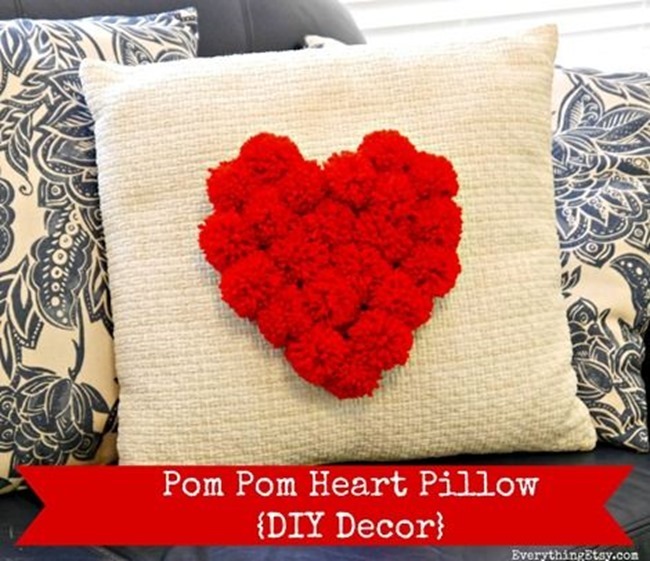 You might want to try making a Pom Pom Heart Pillow like this one. I get tons of compliments on it! Here’s how to Make Your Own Pom Poms the easy way for all your crafty projects. 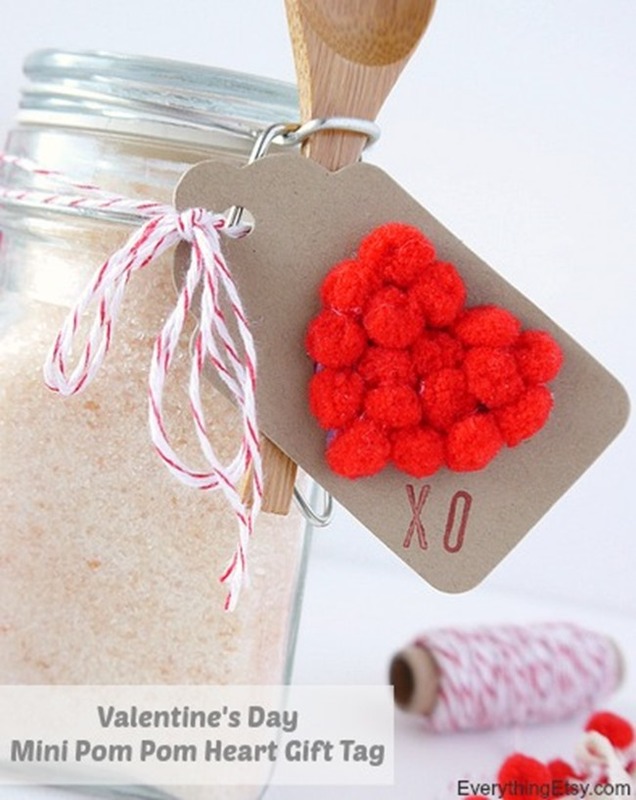 Valentine’s Day and pom poms seem to go together perfectly! Have you make anything with pom poms lately??? Kim these are so cute and just make the perfect sweet tag to tie around a jar or gift, Pinning! !